This page includes The WFSC Announcements columns from the 1994 issues of Across the Fence Post. WFSC President Greg S. Schmidt has appointed Karen Weigt as interim newsletter editor for a six-month period, beginning January 1, 1994. Please send all copy to: Karen Weigt, 4184 Rose CL, Middleton, WI 53562. • Reserve a February or March '94 club meeting date. • Join in on the fun. • Get the whole membership involved. Trivia questions, entry form and contest rules will appear in the February '93 issue of Across the Fence Post. Entry form with answers must be submitted by April 1. If you're interested in stamp issues that feature Wisconsin-related subjects, volunteer NOW! The WFSC currently has a vacancy in this position. Research suggested subjects received by the WFSC to determine possibilities for acceptance by the USPS Citizens' Stamp Advisory Committee. All duties performed at your own pace. Contact: Karen Weigt, Secy., WFSC, 4184 Rose Ct., Middleton, WI 53562, phone (608) 836-1509. Formed in 1933, the Lake County Philatelic Society originally joined the WFSC in 1947. Except for a few periods of years, the LCPS remained on the WFSC membership rolls until 1989, and we're happy to have them back again as of January 1994. As an active group, the LCPS hosted the WFSC annual convention in 1958. The LCPS currently has 15 members, and it sponsors an annual public philatelic auction. Many may recall having visited LACOPEX, their annual exhibition, which just might be revived. The club meets at 6:30 p.m. the fourth Tuesday of each month at the Warren-Newport Library, 224 N. O'Plaine Rd., Gurnee, IL. WFSC President Greg S. Schmidt has appointed Ron Hayes to serve as the WFSC newsletter-advertising manager. This new position relieves the editor of ad related matters. Hayes is experienced in the field of advertising; he runs Hayes Advertising/Graphics in Monroe, WI. He's the current WFSC SW Region VP, president of the Badger Stamp Club, and an avid collector and exhibitor of used plate number coils. Send all ads (commercial and stamp show) and payment directly to: Ron Hayes, 2641 20th Ave., Monroe, WI 53566 - phone (608) 325-4929. Please continue to send "Stamp Show Calendar and Registry" listings to the editor. See p. 8 for more specific advertising information and new ad sizes. President Greg Schmidt has called a meeting of the Executive Board for Saturday, February 26. The meeting will be held at the Holiday Inn, Fond du Lac, WI. All interested parties are invited to attend and are extended the right of discussion, but only members of the Executive Board, specific appointees and the chair or appointed representative of a committee are permitted to vote. If you'd like to be included on the mailing list for specifics regarding the meeting, contact: Karen Weigt, Secy., WFSC, 4184 Rose CL, Middleton, WI 53562 - phone (608) 836-1509. Please volunteer NOW so we can get rid of this repetitive announcement. We need to fill the vacancy for a position on the Wisconsin Stamp Suggestion Committee. If you like stamp issues that feature Wisconsin-related subjects, this is the job for you. Research suggested subjects received by the WFSC to determine possibilities for acceptance by the USPS Citizens' Stamp Advisory Committee. Correspond with the CSAC. Take pride in your efforts and achievements. All duties performed at your own pace. Contact: Karen Weigt, Secy., WFSC, 4184 Rose CL, Middleton, w153562 - phone (608) 836-1509. Both the Northwestern Mutual Stamp Club and Sheboygan Stamp Club graciously sent WFSC Treasurer Deanna Juhnke donations to support postage costs for distribution of ATFP. Such donations are always welcome, as production and distribution costs consistently exceed income generated by the newsletter. While the Newsletter Committee is working on this problem, it may be some time, if ever, that the WFSC can balance the books on this most important means of communication and benefit of membership. If you like the new newsletter, your club might express it by also sending a check to: Deanna Juhnke, Treas., WFSC, 3701 Jordan Ln., Stevens Point, WI 54481. Note that the funds are to be earmarked for newsletter expenses. This "loose" group, organized in the 1930s, traditionally meets annually, immediately following the WISCOPEX banquet. Its purpose is to promote and support youth philately within the WFSC. The Footloose Filatelists purchase gifts and awards for all WISCOPEX youth exhibitors. And, dues are just $1/yr.! Footloose President Douglas Galaszewski invites all individuals belonging to WFSC member clubs to become "Fellow Footloosers." Attend the meeting at WISCOPEX '94 and get a jump on paying your dues by sending $1 to: Douglas Galaszewski, FF, 9906 W. Grantosa Dr., Wauwatosa, WI 53222-1411. Enclose a SASE for a new or replacement membership card and FF ribbon. We're still looking - please volunteer NOW so we can get rid of this repetitive announcement. We need to fill the vacancy for a position on the Wisconsin Stamp Suggestion Committee. If you like stamp issues that feature Wisconsin-related subjects, this is the job for you. Research suggested subjects received by the WFSC to determine possibilities for acceptance by the USPS Citizens' Stamp Advisory Committee. Hold your own supply of official WFSC stationery. Correspond with the CSAC. Take pride in your efforts and achievements. All duties performed at your own pace. Contact: Karen Weigt, Secy., WFSC, 4184 Rose Ct., Middleton, WI 53562 - phone (608) 83b-1509. Thank you to the Milwaukee Philatelic Society and MILCOPEX '94 Committee for providing the WFSC with society table space for the full three days of the show. The WFSC Publicity and Public Relations Committee found it to be a most productive weekend. We touched base with 28 of our 32 member clubs and, as always, it was an enjoyable experience. The table also gave us the opportunity to distribute many show and event fliers for our clubs. This year, we additionally directed an exceptional number of beginning and lone collectors to Wisconsin clubs within their areas. Fifty copies of our flier that includes the dates, times, and locations of all our member club meetings were given to show visitors. At least 40 of the recipients expressed a specific interest in attending a local stamp club meeting. We appreciate the MPS's hospitality and the chance to provide this extra service to our member clubs. The WFSC is always anxious to promote its member clubs. To do this, however, we need your publicity fliers and up-to-date information. Please keep us supplied with such materials and especially when it comes to events like MILCOPEX and WISCOPEX. Anyone from your club can simply drop off the information at the WFSC society table. Regarding show fliers, we noted at MILCOPEX that even though your club had placed a supply at the registration table, many people missed them at that location. It's advantageous to ensure that the WFSC table has these fliers, too. This most popular comprehensive document will be updated and sent to all member clubs with the September issue of Across the Fence Post. Fliers are for distribution to your membership and to visitors at your upcoming events. If you want your show/bourse to appear on the list covering events thru the summer of 1995, send details by no later than August 15, 1994, to: Karen Weigt, 4184 Rose Ct., Middleton, WI 53562-4339 - phone (608) 836-1509. Thank you to Dennis Lemke, owner of University Avenue Stamps, Middleton, WI, for the large donation of stamps to the WFSC Youth Division. On April 30, two WISCOPEX '94 covers were found on the registration table in the room where the WFSC Annual Business Meeting took place. The owner may claim the covers by contacting: Deanna Juhnke, 3701 Jordan Ln., Stevens Point, WI 54481 (715) 341-3465. She'll mail them to you free of charge. The WFSC is the recipient of funds donated by the First Day Cover Collectors of Wisconsin when it disbanded in 1993. The money was donated with the stipulation that it be used for junior philatelic activities within the Federation. The Federation is beginning to explore the possibilities and is soliciting the input of any club, individual, or youth leader. The money donated is approximately $250. According to WFSC records, 15 clubs report having youth leaders and are presumably working with interested youth at their clubs. How should this money be used? Send your ideas to: MaryAnn Bowman, VP Youth Division, P.O. Box 1451, Waukesha, WI 53187. Your suggestions should be received by September 15, 1994, so that WFSC action can be taken this year. This most popular comprehensive document will be updated and sent to all member clubs with the September issue of Across the Fence Post. Fliers are for distribution to your membership and to visitors at your upcoming events. If you want your show/bourse to appear on the list covering events thru the summer of 1995, send details by no later than August 15, 1994, to: Karen Weigt, 4184 Rose CL, Middleton, WI 53562-4339 - phone (608) 836-1509. The WFSC extends its many thanks to Art Arntsen, of the Badger Stamp Club, for auditing the WFSC's 1993 financial records. Nominations are now being accepted for the 1995 Wisconsin Philatelic Hall of Fame. The deadline is December 31, 1994. Qualifications required of nominees are: (a) contributions of a purely local club nature shall not be the sole reason for selection to the Hall of Fame; and (b) a deceased philatelist may not be nominated or considered for selection until three years after his/her death. Send your nomination(s) together with a statement identifying the nominee, a short philatelic biography, and the reasons why that person should be selected for the Wisconsin Philatelic Hall of Fame to: Karen L. Weigt, Secy., WFSC, 4184 Rose Ct., Middleton, WI 53562-4339. Only WFSC member clubs may submit nominations, and two other member clubs must second each nomination. The nominating club is responsible for making arrangements with the seconding clubs to provide those seconds. The nomination and seconds should be sent to the WFSC Secretary in one mailing. The WFSC will again sponsor the annual nationwide cover exchange. All stamp clubs, philatelic organizations, and individuals may participate. Clubs with leftover show, commemorative and first-day covers can reduce their inventory by exchanging them for different covers that can be used as club auction items, door prizes or gifts. The exchange program is being conducted in conjunction with National Stamp Collecting Month in October. The ex-change offer will expire October 31, with returns being made to participants by mid-November. Participants must submit 10 all-alike covers and a large 52 ¢ SASE. Eight different covers will be sent back. (The extra covers will be used for the WFSC's youth program.) Only unaddressed cacheted covers bearing either pictorial or first-day cancels can be submitted. A maximum of 20 covers can be submitted. The cover exchange program coordinator reserves the right to return covers considered unsatisfactory for exchange. To participate, send your covers and a 52 ¢ SASE to: WFSC, P.O. Box 1451, Waukesha, WI 53187. Effective immediately and until further notice, send all advertising materials to Karen Weigt, Interim Editor, ATFP, 4184 Rose Cl., Middleton, WI 53562 - phone (608) R36-1509. Ron Hayes, our advertising manager, will resume his position as soon as possible. If you've recently submitted any ads to Ron, he'll take care of forwarding them to Karen. President Greg Schmidt has called a meeting of the Executive Board for Saturday, November 5. The meeting will be held at Robbins Restaurant, Oshkosh, WI. All interested parties are invited to attend and are extended the right of discussion, but only members of the Executive Board, specific appointees and the chair or appointed representative of a committee are permitted to vote. If you'd like to be included on the mailing list for specifics regarding the meeting, contact: Karen Weigt, Secy., WFSC, 4184 Rose Ct., Middleton, WI 53562 - phone (608) 836-1509. Send all advertising materials to Karen Weigt, Interim Editor, ATFP, 4184 Rose Ct., Middleton, WI 53562 - phone (608) 836-1509. Ron Hayes, our advertising manager, will resume his position as soon as possible. If you've recently submitted any ads to Ron, he'll forward them to Karen. Congratulations to Fred Ziemann! 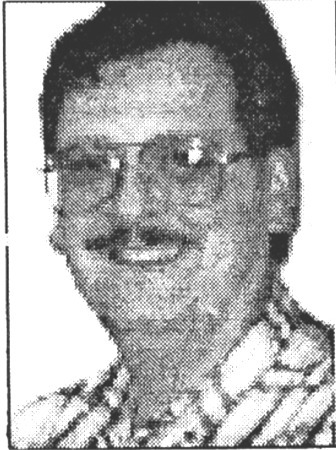 Fred served as editor for the WISCOPEX '93 show program, which recently received a silver award in the American Philatelic Society Chapter Activities Committee 1993 Chapter Show Program Critique. WISCOPEX '93 was hosted by the Wisconsin Valley Philatelic Society (Wausau). The show program centered on the theme "Be Wild - Collect Stamps" and featured a colored photo of a Panda Bear holding a pane of the Wild Animals booklet stamps. WISCOPEX '95 Show Chairman Dan Undersander reports that all tables for the 16-dealer bourse have been reserved. Exhibitors are urged to get their name on the list to receive the prospectus, which will not be published in Across the Fence Post this year. Frames are limited and entries are due by March 1. 1995. Write to: WISCOPEX '95, 4184 Rose Ct., Middleton, WI 53562-4339. Your recent donations of stamps and covers to the WFSC Youth Division are greatly appreciated! The WFSC is very thankful for your $25 check to help cover mailing expenses for Across the Fence Post. It's support like this that keeps us going! We need to keep up with the rising postage costs expected to hit in 1995. The WISCOPEX '95 Exhibitor Prospectus and Official Entry Form are now available. Note, these documents will not be published in Across the Fence Post this year. To receive copies, send your request to: WISCOPEX '95, 4184 Rose Ct., Middleton, WI 53562-4339. Frames are limited and entries are due by March 1. 1995.